There is an ongoing philosophical debate about not telling the truth. Yes, I know, honesty is the best policy. My mother used to have a little card stuck on her refrigerator that said a lie is any communication with the intent to deceive. And at first glance, most of us would probably agree that deceiving someone is bad, and that we should always tell the truth. But life is rarely as black-and-white as little sayings on refrigerators. Aside from the obvious jokes about how to answer the question, “Does this dress make me look fat?” there are times when varnishing the truth may be more compassionate than coming clean about the reality of the situation. Seeking someone out at church who has just given a truly awful musical performance to tell them how bad it was may be honest, but it is hardly charitable. A dying parent pulled from the burning wreckage of a car doesn’t need to be told that their child is already dead; their final moments would be less tormented if they thought their child was safe and sound. And encouraging a belief in certain magical figures around the holidays never gave me a moment’s pause, but rather taught me to cherish the gift of wonder that is instilled in children. It also gave me a perfect opportunity to learn to give without expecting anything in return, and if that isn’t consistent with the teachings of the Baby whose birth we celebrate, well, maybe I missed something. 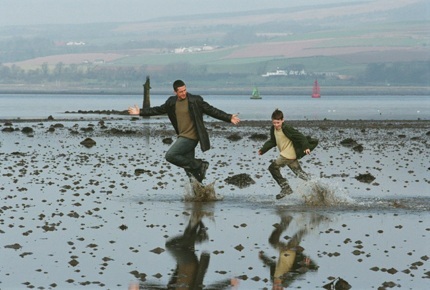 Dear Frankie is set in a seaside Scottish town and tells the tale of a nine-year-old boy living with his single mother and his grandmother. They’ve been on the move as long as Frankie can remember, which makes it very hard for him to adjust or to make friends. Frankie is deaf but is very bright and very perceptive, and is played with deft nuance by Jack McElhone. His mother, Lizzie, is very protective of her young son, and has been hiding for years from her very, violently abusive former husband, Frankie’s father. To help shield him from the painful reality of what his very young life was like, she has invented a story about how she and Frankie’s father were divorced when he was a baby, and how he is a sailor on a freighter called the HMS Accra. Frankie has for years dutifully plotted the travels of his father’s ship on a large map on his bedroom wall, reading with great anticipation each letter he receives from his father. The letters, however, are all secretly written by his mother, Lizzie, and she hides away all of Frankie’s letters written to his father. The subterfuge is successful for a number of years, but then one day Frankie learns that the Accra will be coming into port in the very town where they live. Lizzie is panicked, never dreaming that there was such a ship by that name. As Frankie is understandably excited about the prospect of meeting his father, Lizzie can hardly pack up and leave town, but instead goes in search of a man to play the part of Frankie’s father for a day. The stranger she meets turns out to be more than she expected, and the relationship that develops between the sailor and pseudo-son is genuine and moving. Lizzie is portrayed by Emily Mortimer, who gives a powerful performance as a mother desperate to protect her son but unable to trust anyone, caught in the ironic web of lies she is living herself. The quiet stranger is movingly played by Gerard Butler in one of his most honest and understated performances. Dear Frankie was written by Andrea Gibb and directed by Shona Auerbach. Neither of them have very many other film credits to their name, and indeed, Dear Frankie was released in 2004, so I’m not sure where they’ve disappeared to or what they’ve been up to lately, but I hope they’re working on more stories like this one. I love the heart-warming simplicity of this film, its small but talented cast, and its truthful presentation of black-and-white choices we often face in a rather shades-of-gray world.